Presented here, a fine gameboard in untouched original paint. 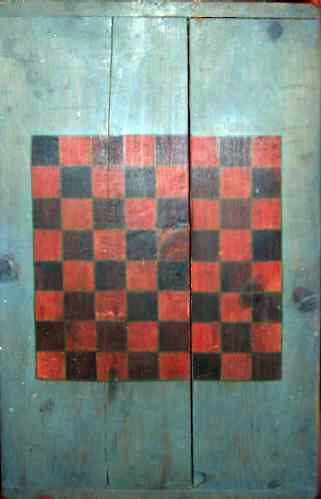 Colors are Red and Black on a Gray Board with the squares outlined in dark green. The board is made of two pieces of pine with breadboard ends. As you can see in the picture, the boards, over the years have shrunk away from each othe leaving a slight separation. The playing surface is in unusually good condition with most all of the paint intact and only some minor scratches one would expect from age and usage. A nice honest little board dating from the turn of the century or perhaps a bit earlier. Size is 25" long x 15-1/2" wide x 3/4" thick.